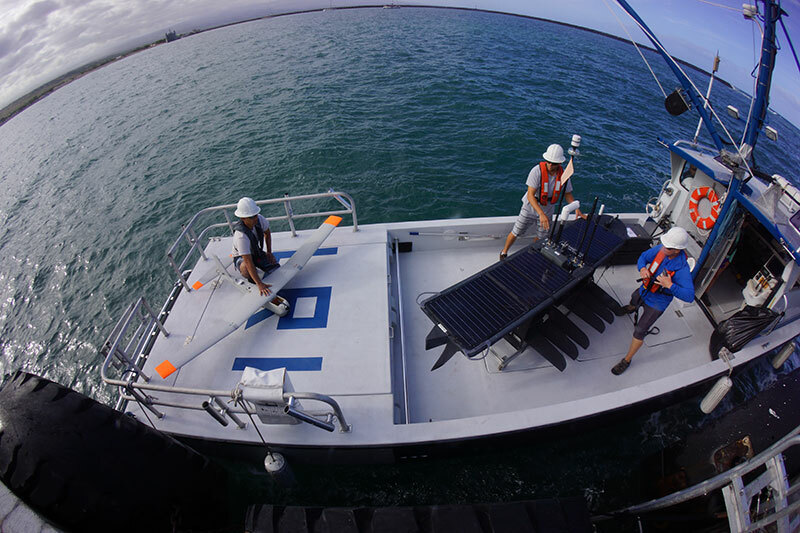 NOAA’s Office of National Marine Sanctuaries has successfully tested the integration of two different types of unmanned systems for potential use in research and management of national marine sanctuaries. The tests earlier this month in Hawaiian Islands Humpback Whale National Marine Sanctuary involved NOAA’s Puma unmanned aircraft system and Liquid Robotics, Inc., Wave Gliders®. During the tests, two Wave Gliders equipped with acoustic sensors and positioned a few miles apart, were able to identify and relay the location of a target vessel that entered their vicinity to the operations center. This information was programmed into the Puma which was then able to locate and photograph the target. The test simulated real-life management situations that could include vessels and marine life in distress, marine surveys, and access within marine protected areas. The Puma is a 13-pound, battery-powered aircraft with a nine-foot wingspan, equipped with real-time video and photo capability. The aircraft can be hand-launched and recovered from any location on land or at sea from a boat. Durable and rugged for deployment to remote marine areas and repeat usage, the aircraft can fly for up to two hours on a single charge and cover a range of about 50 square miles. The Liquid Robotics Wave Glider has a propulsion system that uses both wave-powered and stored solar energy to navigate challenging ocean environments. Its innovative design allows it to cost-effectively collect and transmit data gathered during missions of lasting up to a year, over thousands of miles, or while remaining in place. Individual or small group glider deployments carry suites of sensors and operate individually or in fleets. NOAA's mission is to understand and predict changes in the Earth's environment, from the depths of the ocean to the surface of the sun, and to conserve and manage our coastal and marine resources. Join us on Facebook, Twitter , Instagram and our other social media channels.